All our trips are genuine Quality Assured trips (assessed by Visit Scotland / Tourist board) - 4 stars meaning "an excellent standard of facilities and services". We have now been established for 27 years and pride ourselves in providing a great quality experience and a reliable regular service with unparalleled flexibility and choice. Our trips operate 7 days a week (normally a minimum of 4 trips per day) for the whole of the main season which for 2019 runs from the 1st April until the end of October (weather permitting!). Some trips are also available between November and March. We carry a maximum of 40 passengers and do not operate a minimum numbers policy - so you will always receive a personal service and once booked are guaranteed your trip (weather permitting). The Bella Jane is a Lochin 38 - a high-specification, modern, powerful sea-going vessel with a comprehensive range of safety equipment commensurate with our 2 operating licences. The Bella Jane is easy and safe to board with 100% non-slip surfaces and an elevated level open deck giving excellent views. We have a weather canopy and wheelhouse seating for passenger comfort and shower capes are also available on board. We give an informative commentary on every trip which brings colour and depth to your visit. This is also available (in text form) in German, French, Italian and Spanish. 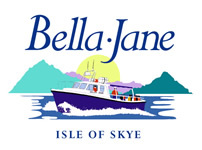 Over our 27 years the Bella Jane and AquaXplore have been featured on TV many, many times - including the Travel Show, Wish You Were Here, Coast, Grand Tours of Scotland and many other documentaries and films. 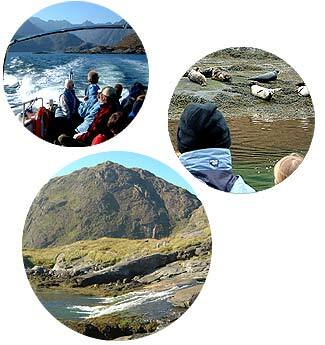 During the trip to Loch Coruisk we visit the resident seal colony which lives on the small islands at the foot of the mountains. Males and females can be seen as well as new born pups from mid June. Loch Coruisk has been visited by some famous people: Sir Walter Scott, Boswell and Johnson and the painter JMW Turner. Coruisk is believed to have been formed around 280,000 years ago by glacial activity. The last glacier retreating about 10,000 years ago. Coruisk - Coir Uisg in Gaelic - means corrie of water. It is advisable when taking the walk to Loch Coruisk to wear sturdy shoes or walking boots. Dogs are very welcome but we advise you to contact us prior to your trip.